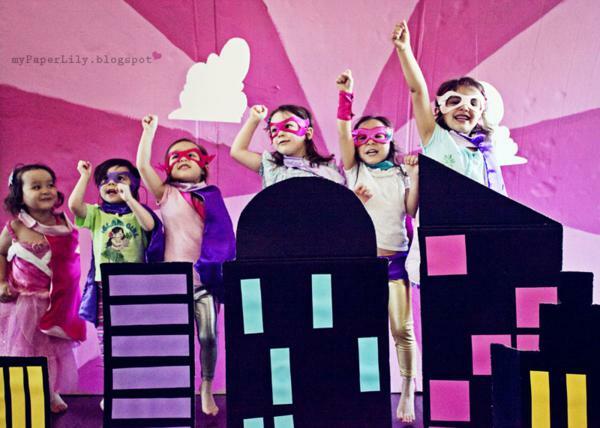 How fun is this SUPERHERO 5TH BIRTHDAY PARTY for a GIRL?! Love it! 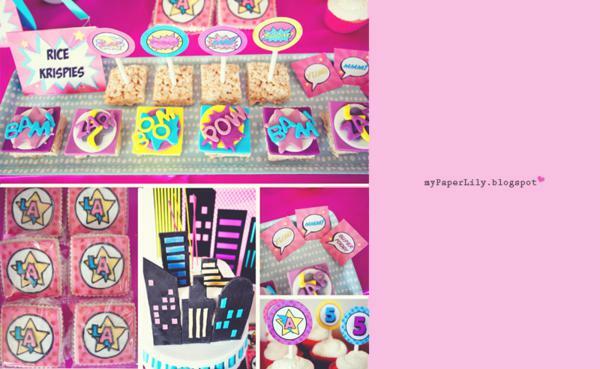 The party was styled and submitted by Rebeca K of My Paper Lily. 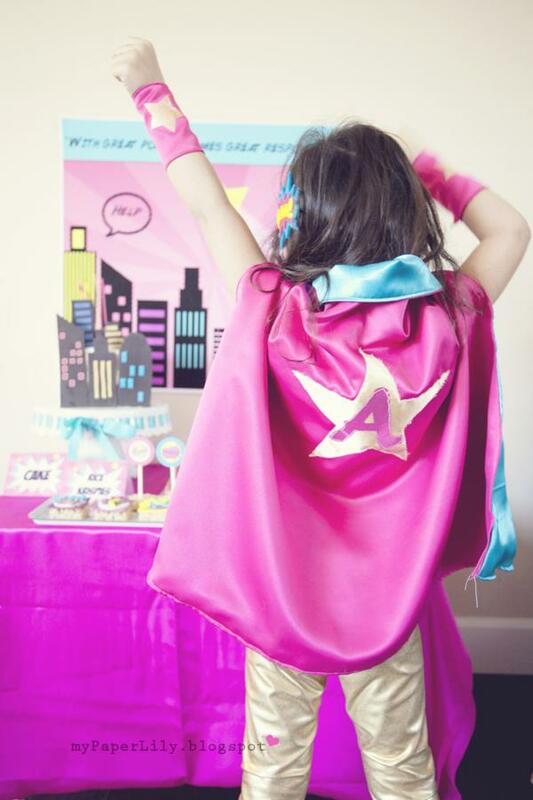 Rebeca said- “MY daughter, Ava turned super FIVE this past March! 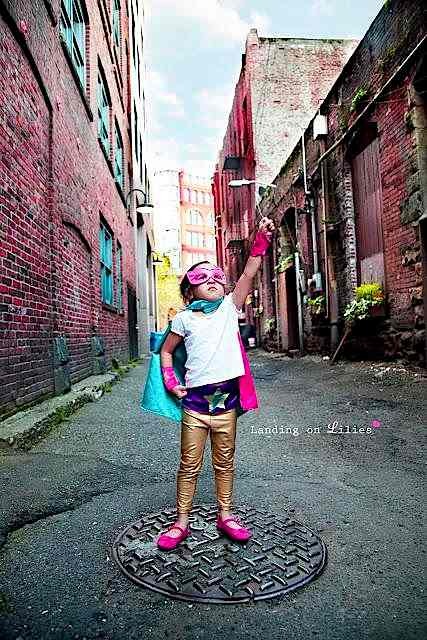 I had asked her what kind of party she wanted this year, and to my surprise she yelled out, ” A SUPER HERO party!” It isn’t really considered a girly party, I guess, so princess crowns and fairy wings had to be erased from my mind. The challenge wasn’t too difficult, but gathering ideas was a little more like a treasure hunt. 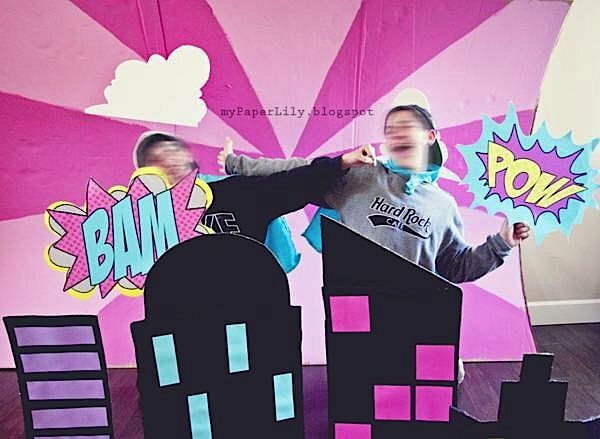 Like every superhero party, there had to be a London Phone Booth to change into their life-saving outfits! The Phone Booth became a secret hide-out or a place to escape from the bad guys. Who is saving who!? Haha. I got the box from Lowes. As soon as the children walked in through the door they were immediately presented with their Superhero capes, masks, and hair clips! 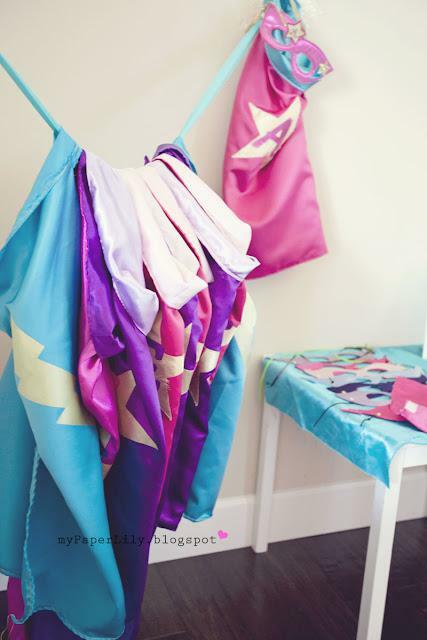 I made the capes myself along with their belts, and arm cuffs. MUCH more CHEAPER! I am always on a budget, and I’ve probably mentioned this way too many times in my blog posts.Therefore, the dessert table was simple. All that was included were cupcakes ( I made), cookies, rice krispie treats ( I made), and Ava’s cake ( I made). For the sunburst backdrop, I used a second fridge box! I lined up painters tape (that blue tape) to help guide me with the sunburst lines. Then, I alternatively painted two types of Pink colors which I purchased at Walmart. It worked out great! For a while I had a hard time figuring out what I could use to create the Sunburst because I didn’t want to spend money on Fabric! This was so much cheaper, absolutely FREE – except the paint.The city was also made from left over cardboard boxes from our recent move. I cut it up to match her invitation. I wanted the parents to have some fun too! 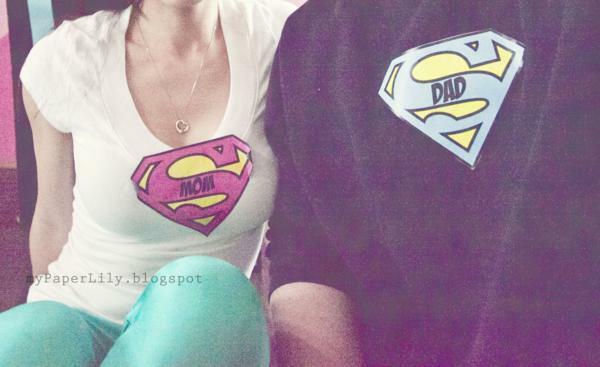 So, I made these Supermom and Superdad stickers to pass around. It generated quite the laugh! I’ll work on having them available soon. How adorable! 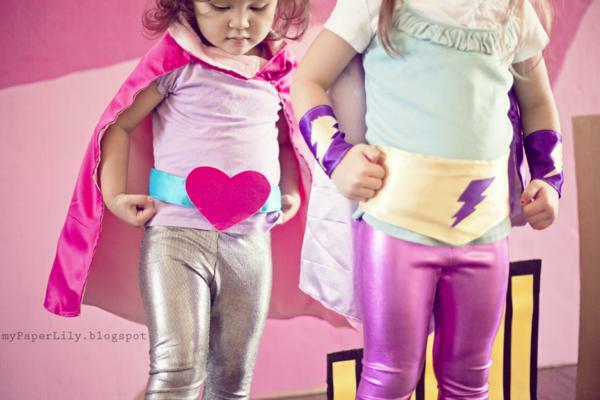 Love the capes! what an awesome idea! 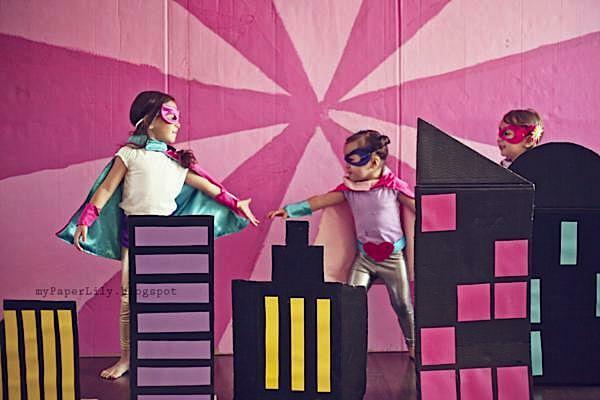 My daughter is a bit of a tomboy who loves cars, trains and superheros but most of her girl friends are into fairies and princesses so this sounds like a great compromise. And the boys won’t be disappointed either! how awesome is this party!?! what a great idea with the telephone booth! 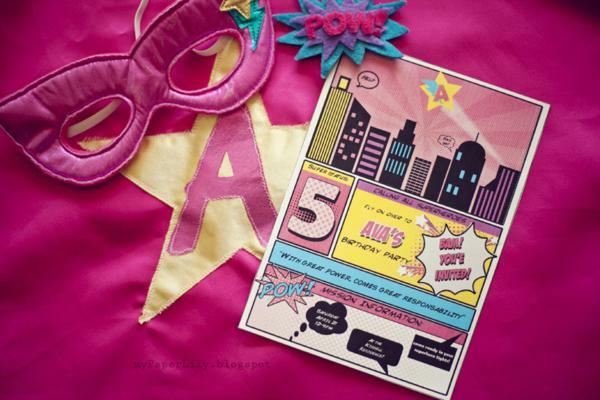 We are now in party plan mode for my daughters super 5th birthday. Love all the ideas and will trying to have a go at trying to make ours as wonderful as yours! 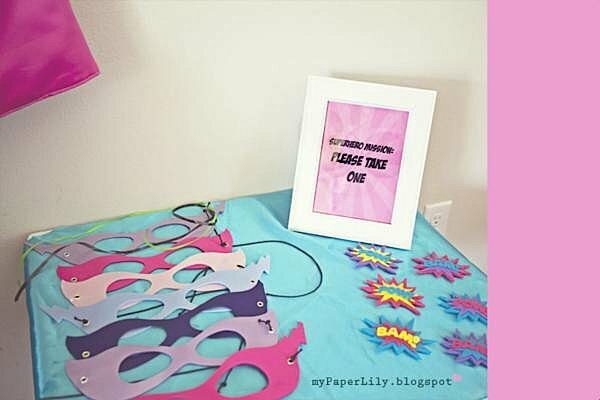 Have looked at lots of super hero invites but can’t find anything as nice as yours where can I get them or a printable version as I’m in Australia. 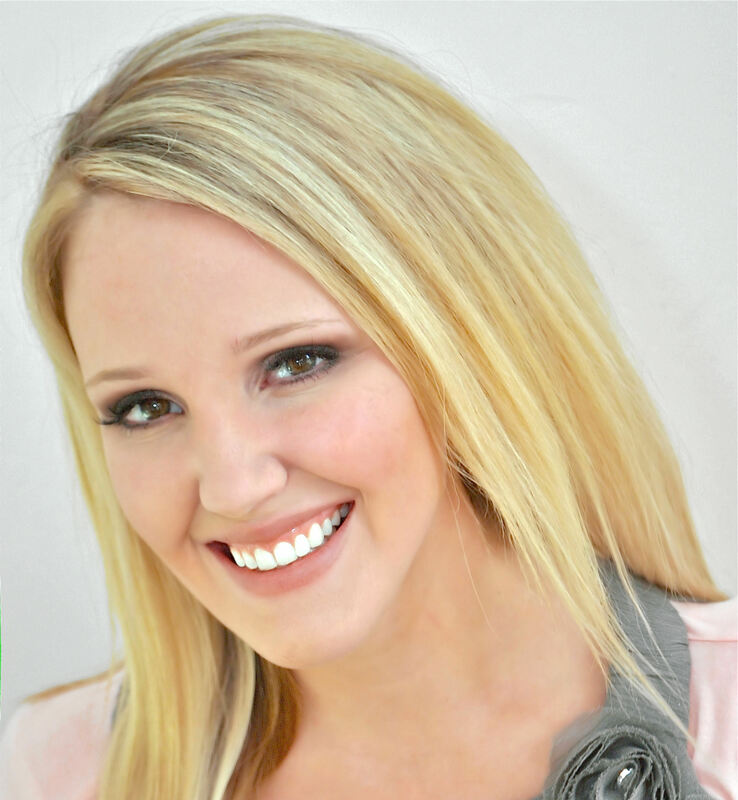 Thank you soooo much for sharing! 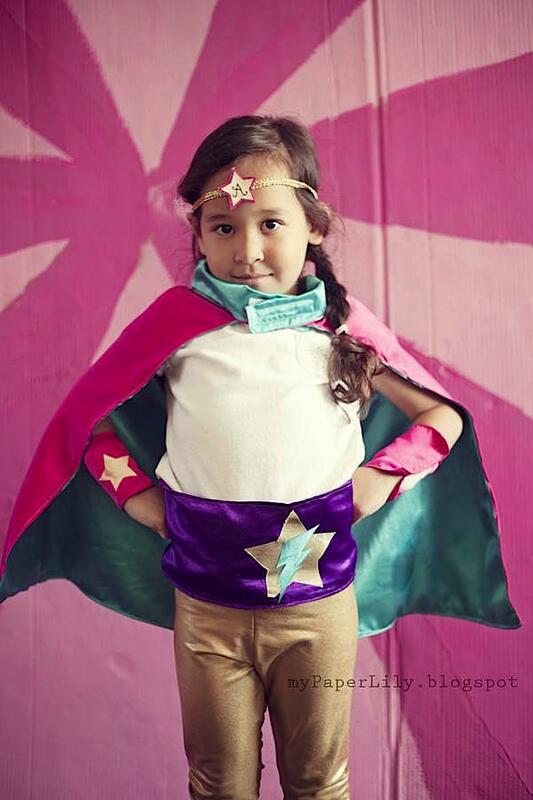 My daughter’s a bit of a tomboy but also loves dressing up and princess-y stuff. Last year, she demanded a spiderman party (which we didn’t end up having) so I will absolutely be planning this theme for her party this year. Got 5 months to go, so I’ll get planning! where did you get the pink backdrop from?